Fawncastle Guesthouse Estate is set in the heart of Hillcrest. Only 1.5km from the R103, Hillcrest Old Main Rd. A mere 2.9 km from Hillcrest Centre, 16.5km from Pinetown or 35.6km from Durban’s Prestigious Beachfront and Ushaka Marine World. Fawncastle Guesthouse Estate is the perfect setting for the international traveler, or local businessman, looking for a relaxing evening after a long days work. Fawncastle is graded as a four-star guesthouse with 8 executive suites and 4 standard suites. The executive rooms are individually appointed, fully air-conditioned, each fitted with their own DStv decoder, flat screen television, fridge, microwave, and all the little comforts to make sure your stay is as comfortable as possible. Our staff are on hand to attend to whatever you may need. Breakfast is served from 6h30 to 9h30. We offer a traditional English Breakfast, with everything from bacon and eggs, to omelettes, french toast, yoghurt and oatmeal. We also offer specially packed meals, or lunches, on request. We have two conference rooms, the largest capable of seating up to 50 delegates, whilst the smaller can cater for up to 12 delegates. Each room is fully equipped with data projector, flip charts, white boards, and delegates supplies. Our in-house chef, the owner of Fawn Castle, will delight you with her home cooked lunchtime meals, and dinners. 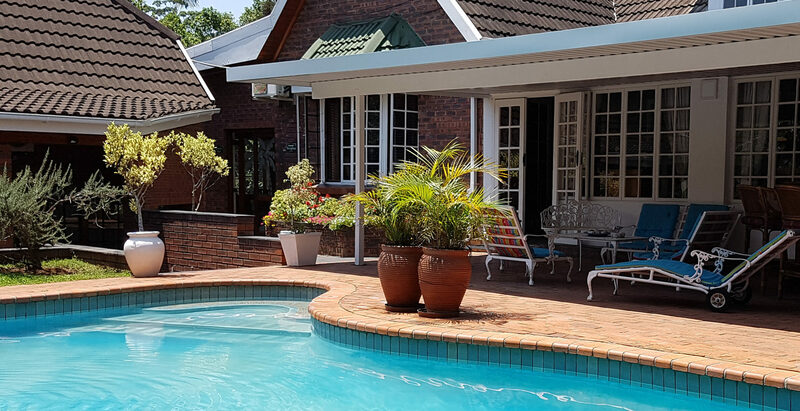 Fawncastle Estate, set in the heart of Hillcrest, is a mere 15km from Pinetown, Hammersdale and Cato Ridge and is the perfect setting for an evening’s rest after a workday or pottering about 1000 Hills. For more information, please contact Kim Deetlifs, on the number provided.